This spring I planted a simple 16-inch terra-cotta container with Simpson Black-Seeded leaf lettuce and Bingo Blue pansies. The chartreuse lettuce leaves were incredible next to the blue-green foliage and dark blue flowers of the pansies. It was so beautiful I’m going to use the same combination next year. Container gardens look great in formal or informal, residential or commercial settings. 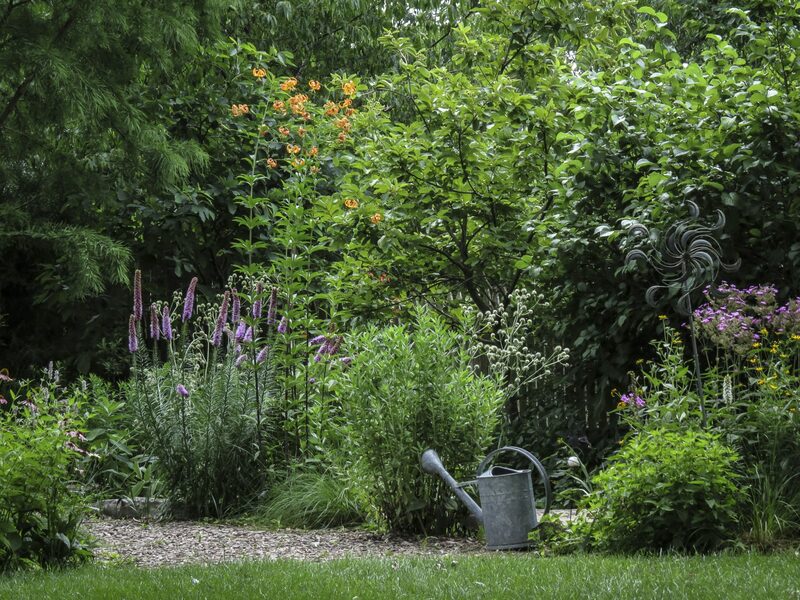 These gardens are generally easy to reach and can be worked from any side. You can even move them for different occasions, and they are a good way to garden in small spaces. Containers can be used to put plants where plants cannot normally be grown, and they can be placed in spots needing a splash of color or other visual variety. As the warm season kicks into high gear, container gardens can become a real challenge to keep watered and looking good. The key to successful container gardening is to select the largest container you can handle and fill it with excellent planting media. Container gardens have different requirements from the normal landscape, and depend entirely on you for their water and nutrients. By far the most important feature for plants to thrive in any container is the drainage hole. The drain hole will allow for complete saturation of the media when watering and allow excess to run off. Your containers don’t have to be brand new to be good. In fact, some of the most beautiful containers are recycled from other uses and can be found in garages or basements. Buckets, bushel baskets, you name it. I have even seen an old cattle-watering trough that looked great as a container garden. If you clean and store them properly for winter, whatever you choose will last for years. Containers made of clay provide a healthy environment for roots to grow, allowing air and moisture to penetrate the sides, though this can also cause them to dry out quickly. Containers made of plastic are flexible and strong. They also weigh less than clay and provide more color choices. I recommend avoiding extremely dark colored containers outside because they tend to collect heat, which can damage the roots. Selecting the growing media for your containers can present one of the greatest challenges. Growing media is the name given to all material other than soil used to grow plants in containers. These materials vary greatly in their ability to hold water and nutrients. It is important to know the characteristics of each before you make your choice. Garden soil or topsoil used alone is not acceptable. These soils hold too much water in a typical container and generally harbor weed seeds, insects, and diseases. Once sterilized, these products are essential components to a good container media. Peat or peat moss is partially decomposed plant material. Sphagnum peat moss is derived from the sphagnum mosses generally from Canada and Northern Europe. It is the best quality peat and is an important additive to many growing media. Commercial mixes like Pro-Mix and Metro-Mix are professional mixtures of sphagnum moss, peat, bark, perlite, vermiculite, processed bark, or expanded shale with a wetting agent. They are convenient to use and are suitable for most plants, although there is growing concern over using products that are harvested from our native environments. Last year I started using a new line of container media and soil-amendment products available called Mr. Natural®. These products have no added chemicals-they are natural, organic, and contain only recycled materials. The Complete Landscape Mix is an excellent container media alone or in combination with one of the commercial mixes. It is composed of hen manure compost, worm castings, pine bark humus, and Permatill® (expanded slate). It has excellent moisture- and nutrient-holding capacity, and the Permatill allows for excellent aeration essential to the container environment. Starting with a great container and excellent growing media will almost assure success with the plants you choose. The scope of your container garden is then limited only by the amount of sunlight that the plants receive or can tolerate. No matter what plants you choose, always select ones that are healthy and free from insects and diseases. Water them well and fertilize with a soluble fertilizer of your choice twice a month throughout the growing season. Choose annual and perennial flowers, vegetables, tropicals, all types of fruits, and ornamental plants, or any combination of these for fabulous container displays.